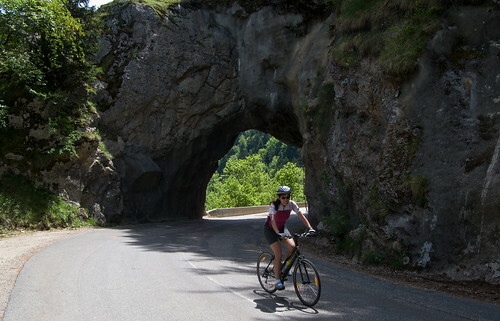 Doreen and I are spending the long weekend cycling in the beautiful Le Parc Naturel Régional du Vercors - famous for it's savage gorges. Doreen and I are spending the long weekend in the beautiful Le Parc Naturel Régional du Vercors – famous for it’s savage gorges. It’s our first time here and we started with a great loop (map at bottom) from Villard de Lans – through the Gorges de la Bourne and then climbing up a huge massif to the Col d’Herbouilly, before descending back to Villard de Lans. The scenery is beautiful here. We are looking forward to more gorges tomorrow if the rain holds off. The distance is not bad, but look at that vertical … wooohooo! Wish we could be there too with you guys, so please enjoy for at least four. Great to see some more people who have discovered the Vercors – we holiday there each year and as you rightly say it’s brilliant for both mtb’s (as the routes used for cross country skiing in winter become mtb routes in Summer) and road bikes. If you travel again have a crack at the ascent from Sassenage into the Vercors up to the Col de La Croix Perrin – if you really wanted to finish this off with a spectacular final destination, descend into Autrans and then follow the road up to La Moliere where a final brief 15%+ push delivers a breathtaking panorama of the Alps amongst clunking cow bells. Great site and keep on climbing!! Thanks for the reply – appreciated. As a quick route note Sassenage is at 210 metres and the climb to the Croix Perrin peaks at 1220 metres (23 kms), however, its then a descent to Autrans (5.5 km -great place for lunch) and the climb from there to La Moliere is a further 600 metres (roughly 15 kms) – so a decent 1600 metres plus of climbing. From Sassenage its the D531 (the only way in and up! ), at Lans en Vercors right on the D106 to the Col and Autrans and from Autrans its the D28 towards the Tunnel du Mortier and at the tunnel a forest road (generally in good condition and suitable for a road bike) above the ski lifts (which is always a nice but odd place to be on a bike!) and with spectacular views over the Autrans valley before a final left (signposted turn – this is a horrid 15% plus legbreaker but it’s short – for once yes the end is just round the next corner!) to the summit at La Moliere. If you descend back from La Moliere to the road you can go left again and it will eventually bring you back to the top of the Col de La Croix Perrin, so it can be made into a loop. If you ever make it across to the UK let me know – I can definitely provide some routes which while lacking height in metres, can definitely provide height in metres over distance travelled (with some steep bits that make me wonder how I get by in the Alps!) and some spectacular scenery! thanks Simon, Very, Very kind of you. I have done 4 rides in the Vercors this year and each was magical. I cheated on day 3 of our Vercors trip and did only the top part of Col de la Croix de Perrin as a quick add-on so doing it “properly” is definitely in the cards.